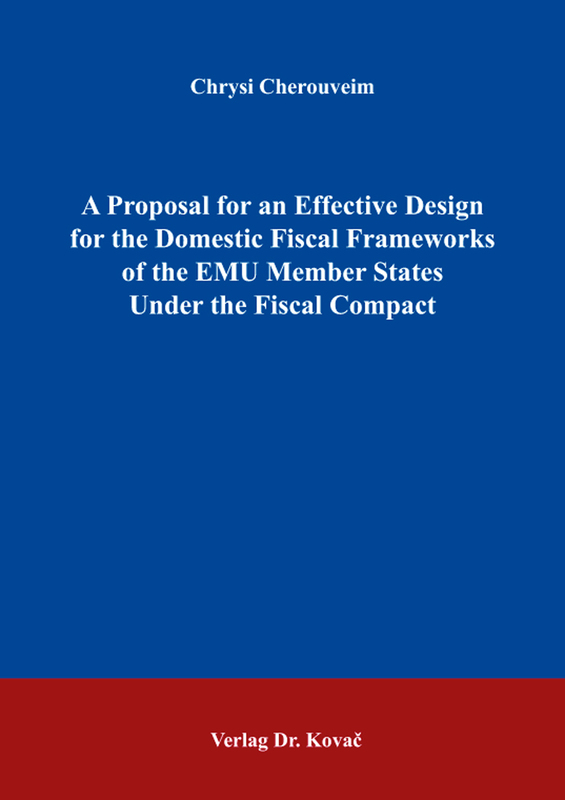 A Proposal for an Effective Design for the Domestic Fiscal Frameworks of the EMU Member States Under the Fiscal Compact. Doktorarbeit von Chrysi Cherouveim, Verlag Dr. Kovač 2016, 180 S.
This book deals with current issues on fiscal policy frameworks at the national level and provides new insights to them. The main purposes is to examine the role of domestic numerical fiscal rules with special reference to the role of the design characteristics of the rules, the social and economic factors and to associate their role with the development of the European Union’s fiscal regulatory frameworks. The main conclusion could be summarized as follows. Firstly, national fiscal rules do have a positive effect on fiscal behavior, especially under a common currency regime. Second, specific combinations of fiscal rules have a stronger positive effect on the EMU countries’ cyclically adjusted primary balances. The treatment proposed by the European Commission which states that due to their design, “expenditure rules should be better combined with balanced budget and/or revenue rules? is thus refined to “expenditure rules should be better combined with balanced budget and revenue rules?. It is proved that the factor “Revenue rules? is crucial to the overall effect of the domestic fiscal framework and it suffices for inverting its direction at least when it is combined with Expenditure and Balanced Budget rules. Third, empirical evidence for the role of the time horizon of the fiscal rules in the domestic fiscal framework context is given. These three points constitute a proposal for an alternative to the Fiscal Compact in its current form. Lastly, ideas for future research are delineated and some limitations are addressed.